"We've written queries with NGS-IQ to show outstanding vendor payments, payment amounts, and the services provided by each vendor." "We rely on federal government matching funds to enable us to meet our obligations. 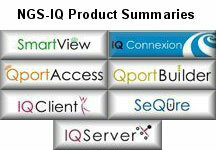 One NGS-IQ report that we run each month shows us the services we've provided that qualify for matching funds. Another shows us what federal funds are still available to us." "We use NGS-IQ to produce demographic reports that show us things like service recipients by age group."